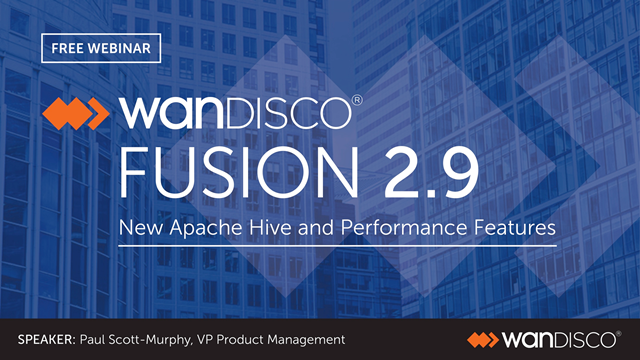 WANdisco Fusion 2.9 delivers new levels of performance and scalability, with a number of enhancements that make it easier to support hybrid big data deployments with continuous and consistent access across any mix of on-premise and cloud environments. One of the most significant new features is the application of WANdisco’s patented active transactional replication to the Hive metastore, used to support familiar SQL-like access to Hadoop. Changes made to table definitions and other objects in the Hive metastore are replicated to Hive metastore instances deployed with other Hadoop clusters. Data added to the underlying Hadoop cluster referencing the new object definitions is replicated to other Hadoop clusters in a subsequent step, to guarantee consistent access across clusters and locations. Join us on October 5th as we present and demo the latest release of WANdisco Fusion. Learn how you can break through the limitations of cloud object storage implementations with a LIVE DATA strategy. Moving to the cloud frees companies from their on-premises confines, and cloud object storage enables vast scalability and flexibility for data in its native format. Yet cloud object storage applications present their own challenges. Legacy solutions dictate what options can be deployed while the risk of vendor lock-in by choosing a single provider restricts future implementations and hampers pricing negotiation. A live data platform that enables active replication ensures that data that is always available, always consistent and always protected, fulfilling on the promise of cloud object storage. Join us as Paul Scott-Murphy, WANdisco VP of Product Management, discusses the benefits of a cloud object storage approach empowered with a live data platform to help companies break down the silos and implement a robust multi cloud strategy. Join us to learn how you can achieve continuous replication at scale between multiple Big Data and Cloud environments with guaranteed data consistency and continuous availability. - How to meet stringent data availability and compliance requirements whilst seamlessly moving production data at petabyte scale from on-premises Big Data deployments to MS Azure. - How to save money and achieve greater ROI with no need for dedicated hardware or storage systems. - How to enable data to span HDFS, object storage, and other systems. - How to select subsets of content for replication with fine-grained control over where data resides. - How to recover from intermittent network or system failures automatically. Register now to learn how to get the most value from your data while also meeting strict service level agreements. Russ Hill, Account & Renewals Manager Americas at WANdisco. Russ Hill works with our existing SCM install base as an account manager and renewals specialist. He works closely with the WANdisco Professional Services team on all SCM service opportunities in North America and is currently responsible for all new SCM opportunities within the Americas. Owen Ofiesh Software Configuration Manager at MaxLinear. Owen Ofiesh is the Software Configuration Manager for MaxLinear, a global chip design firm. With over 15 years experience in configuration management, he has a strong background in many of the most common SCM tools and platforms. Owen has worked with WANdisco Subversion MultiSite for over six years and has a great understanding of how it compares and contrasts with other SCM tools. If business-critical applications with continually changing data are really moving to the cloud, the typical lift and shift approach of copying your data onto an appliance and shipping it back to the cloud vendor to load onto their storage days later, isn’t going to work. Nor will the one-way batch replication solutions that can’t maintain consistency between on-premises and cloud storage. Join us as we discuss how to migrate to the cloud without production downtime and post-migration deploy a true hybrid cloud, elastic data center solution that turns the cloud into a real-time extension of your on-premises environment. These capabilities enable a host of use cases, including using the cloud for offsite disaster recovery with no downtime and no data loss. Fusion® 2.10, the new major release from WANdisco, adds support for seamless data replication at petabyte scale from Network File Systems for NetApp devices to any mix of on-premises and cloud environments. NetApp devices are now able to continue processing normal operations while WANdisco Fusion® allows data to replicate in phases with guaranteed consistency and no disruption to target environments, including those of cloud storage providers. This new capability supports hybrid cloud use cases for on-demand burst-out processing for data analytics and offsite disaster recovery with no downtime and no data loss. In the traditional world of EDW, ETL pipelines are a troublesome bottleneck when preparing data for use in the data warehouse. ETL pipelines are notoriously expensive and brittle, so as companies move to Hadoop they look forward to getting rid of the ETL infrastructure. But is it that simple? Some companies are finding that in order to move data between clusters for backup or aggregation purposes, whether on-premises or to the cloud, they are building systems that look an awful lot like ETL. The cloud greatly extends disaster recovery options, yields significant cost savings by removing the need for DR hardware and support staff on-premises, and provides insurance against a total on-premises infrastructure failure. However, solutions available for cloud DR vary greatly, directly impacting the amount of downtime and data loss experienced after an outage. Join us as we review the solutions available and explain how the cloud can be used for on-premises system DR with virtually zero downtime and data loss. Paul Scott-Murphy, WANdisco VP of Product Management will explain the benefits of moving to the cloud and review the AWS tools available for cloud migration and hybrid cloud deployments. Join experts from New Context and WANdisco as they explain the tools and techniques for securely managing big data in hybrid cloud environments. Attendees will learn what's required for effective data governance with the highest levels of availability and performance on-premises and in the cloud. In this webinar, our experts will review the storage options available to Hadoop architects and provide recommendations for each use case, including an active-active replication option that makes data available across multiple storage systems. Join us on October 6th at 10AM Pacific, 1PM Eastern as we present and demo the latest release of WANdisco Fusion. GigaOM analyst William McKnight will be joined by experts from Qubole and WANdisco, who will explain the benefits of moving to the cloud and review the tools available for cloud migration and hybrid cloud deployments. Learn what's required to avoid the downtime and business disruption that often accompany cloud migration projects. Global enterprises have quietly funneled enormous amounts of data into Hadoop over the last several years. Hadoop has transformed the way organizations deal with big data. By making vast quantities of rich unstructured and semi-structured data quickly and cheaply accessible, Hadoop has opened up a host of analytic capabilities that were never possible before, to drive business value. The challenges have revolved around operationalizing Hadoop to enterprise standards, and leveraging cloud-based Hadoop as a service (HaaS) options offering a vast array of analytics applications and processing capacity that would be impossible to deploy and maintain in-house. - Continuous availability with guaranteed data consistency across Hadoop clusters any distance apart, both on-premises and in the cloud. - Migration to cloud without downtime and hybrid cloud for burst-out processing and offsite disaster recovery. - Flexibility to eliminate Hadoop distribution vendor lock-in and support migration to cloud without downtime or disruption. - IBM's BigInsights in the cloud, and BigSQL, which allows you to run standard ANSI compliant SQL against your Hadoop data. Data is coming from everywhere. The first challenge is just being able to get hold of it, curate and convey it in a secure and transparent manner. Hortonworks Data Flow is the tool that collects data at the edge, processes and secures data in motion and brings data into your data-at-rest platform (HDP). Once you have your data collected in a valuable data lake, you need resilience, control over its location, and safety against failure. That’s where Wandisco Fusion & Hortonworks HDP come in. With Wandisco Fusion on HDP, an enterprise can now build an effective, fast and secure data engine out of multiple Hadoop clusters, getting the most business value out of its HDP deployment with a reliable and high-performing Big Data service. Join Hortonworks & WANdisco on this webinar to learn how to make this into reality. WANdisco is shaping the future of data infrastructure with its groundbreaking LIVE DATA platform, enabling companies to finally put all their data to work for the business - all the time, at any scale. Only WANdisco makes data always available, always accurate, and always protected, delivering hyperscale economics to support exponential data growth with the same IT budget.